1.In fine-mesh strainer, thoroughly rinse quinoa with cold water; drain. Prepare quinoa as label directs. With small spoon, leaving about 1/2-inch wall, scoop out inside portion of each zucchini half; coarsely chop zucchini pulp. 2.Prepare outdoor grill for direct grilling over medium-high heat. In large skillet, cook sausage, onion and reserved zucchini pulp over medium-high heat 5 minutes or until sausage is no longer pink, breaking up sausage with side of spoon. Remove from heat; stir in 1 cup cheese, sun-dried tomatoes, breadcumbs, lemon juice, oregano, lemon zest and quinoa. 3.Brush all sides of zucchini with oil; evenly sprinkle with salt and pepper. Place zucchini, cut side down, on hot grill rack; cover and cook 3 minutes or until grill marks appear and edges begin to brown. Turn zucchini and grill 1 minute longer or until lightly browned but still firm; transfer, cut side up, to rimmed baking pan. 4.Evenly fill zucchini with sausage mixture; sprinkle with remaining 1 cup cheese. 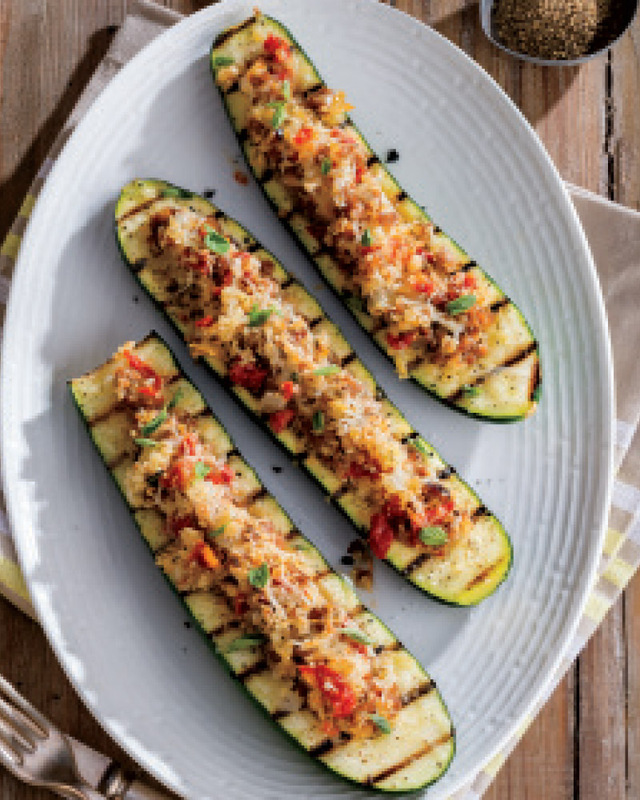 Place zucchini, filling side up, on hot grill rack; cover and cook 5 minutes or until zucchini is just tender and cheese is melted and begins to brown. > Use lean ground turkey in place of Italian sausage to cut down on fat, saturated fat, cholesterol and sodium.